FasTrak® is the smart way to pay your toll on bridges, express lanes, and even for parking at San Francisco International Airport! 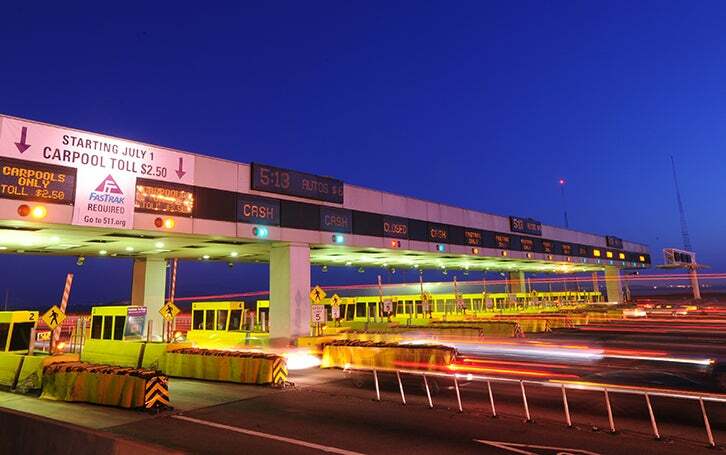 FasTrak makes it quick and convenient to pay tolls. You don't need to carry cash. It’s all done electronically. FasTrak is easy to use. Simply deposit money into your FasTrak account, and each time you use your toll tag, the toll amount is deducted from your prepaid balance. Maintaining a FasTrak account is free — when you close your account and return your tag, the remaining pre-paid balance will be returned to you. For more information about signing up or getting a toll tag at a retail location, visit the FasTrak website. BATA operates FasTrak in partnership with the California Department of Transportation and the California Highway Patrol. FasTrak can be used throughout California — anywhere the FasTrak logo is displayed. FasTrak lets drivers access a growing network of Bay Area Express Lanes that offer a more reliable and less congested commute. Find out more about Bay Area Express Lanes. Pass Through The Hub: Transportation Information Nexus! FasTrak Customer Service Center to Reopen April 25 at 10 a.m.